BlackBerry London's look revamped, much better than before. BlackBerry London’s look revamped, much better than before. So here we have a new image of the rumoured BlackBerry London, which could be the first device to run QNX based BlackBerry 10 OS. It was back in November that we had the first look at the BlackBerry London. But in the latest image of the device, we see a totally revamped look of the London. Compared to the previous picture that leaked, this new designed device looks much like a mini BlackBerry PlayBook, having rounded edges as compared to the sharp edges that appeared in November. 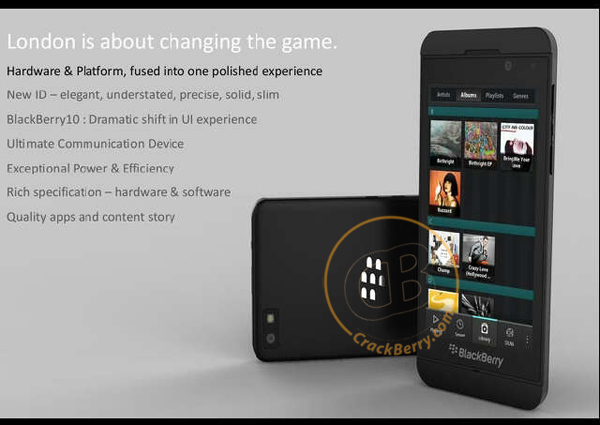 The renewed design looks awesome as compared to the previous leak and other full touch BB devices. I personally am very much impressed with the over look of the London. If this is how RIM plans to design all its future devices, then clubbing up with the BB 10, RIM could surely save itself from near-extinction situation. For now, what we know through the source is that London is specifically targeted for theUK release before it reaches the US. And to compensate it, RIM may launch the ‘Laguna’ and ‘Lisbon’ with LTE on-board in the US and release much earlier than the London. We expect the London to launch by September this year. 1.5 GHz TI OMAP dual-core processor, 1 GB RAM. So are you impressed too with the new device design of the London? Shoot your views in the comments below.